"On average, Google Maps uses about 0.67MB of data every 10 miles and 0.73MB of mobile data for every 20 minutes. According to our research, it uses less than Apple Maps but slightly more than Waze." This probably assumes a pre-download caching by Googlemaps/Waze before you set off. Other sites shows similar figures, depending on whether it cached data beforehand or not. Good point by Morph about the puny 1A fuse in the standard Honda 12V socket. It's so long since I had my NC that I had forgotten about that! Well even those modest requirements could cost you dear in some places. I'm not sure how much map you can pre-download with Google, and how much of a faff that would be for a long journey, as I haven't tried it for a long time, but I prefer to have all the maps installed on my phone, even if that requires a paid for app. Having said that maybe Google now lets you download whole country maps? Someone I know is doing a mega tour from Alaska down to South America and reckons he will download all the Google maps he needs in advance, and in fact is not even going to have a phone contract or SIM for the phone he will use. I think it allows you to download a certain number of sq miles of maps. You can pinch/zoom the amount but there is a maximum. 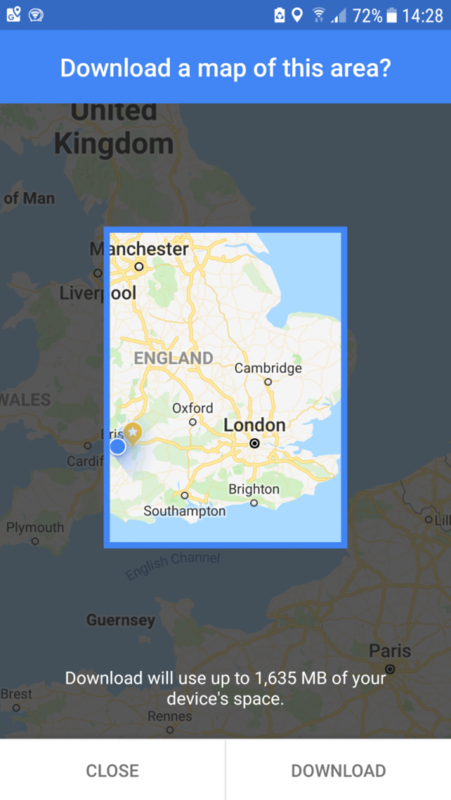 Not whole countries, unless they happen to be very small :-) Here's a snap of the rough max area you can download - it would take up around 1.5GB of your phone memory though. You can of course download multiple sections, overlapping so you don't need data to route between them. This worked for me across Florida. I too use a quadlock mount for my phone, really rock solid, an as for the data usage on Waze app, it doesnt use a great deal at all, and best part being, it shows current traffic situation from other Waze app users too.